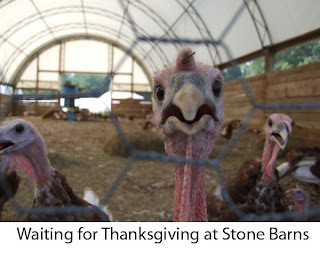 The staff at the American Livestock Breeds Conservancy wishes each of you a happy Thanksgiving. We hope your holiday is filled with family, joy, and relaxation. There has been a lot of media buzz about Heritage Turkeys this holiday season. ALBC is excited to see growing consumer interest in saving rare breeds. By putting them back on the American dinner table, we can increase their population numbers and ensure genetic diversity and security for our agricultural food system. In October as part of ALBC'S Master Breeder program, staff member Jeannette Beranger traveled to Kansas to do a walk-through of Frank Reese's flocks. Frank is the owner and operator of Good Shepherd Poultry Ranch and he's a notable heritage poultry breeder. 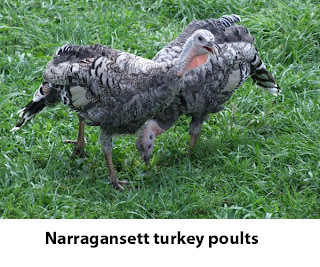 To learn more about Heritage Turkeys, visit www.albc-usa.org. This past week ALBC had the opportunity to partner with two talented local chefs to do a cooking demonstration with rare breeds. The event was educational, fun, and tasty! 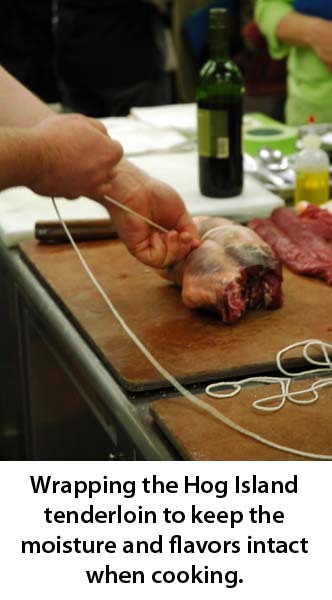 Chef Scott Crawford of Herons at the Umstead Hotel and Spa and Chef Brett Jennings of Elaine's on Franklin shared their culinary expertise and passion for underutilized cuts from rare breeds. They invited us into the kitchen at Herons restaurant and allowed participants to see first hand how to break down a carcass and utilize multiple parts to make a delicious meal. 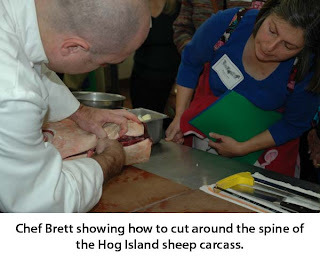 Byran Childress, the Hog Island sheep producer, was also on hand at the clinic to educate participants about the breed. Byran gave a brief history of the breed and answered questions. Many were amazed to learn that the Hog Island sheep is listed as critical on the ALBC Conservation Priority List, meaning there are less than 200 annual registrations of these animals in the United States. An important part of saving rare breeds is developing a market for them - and with many of these breeds that market is food. Heritage breeds have different genetics from your standard industrial breeds; therefore, they have different tastes, textures, aromas, and flavors. 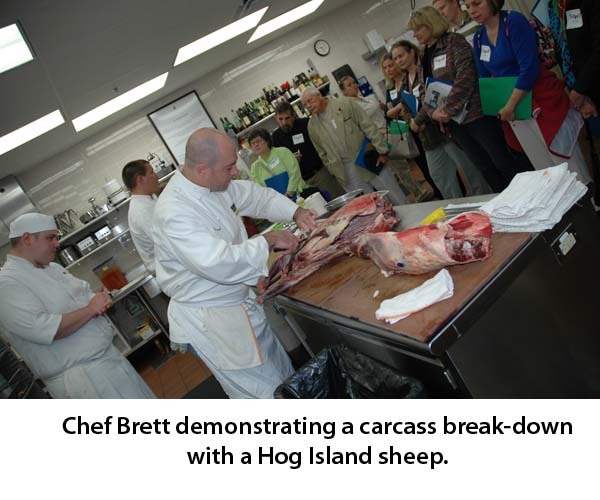 The more ALBC can educate consumers and chefs about these breeds, the more we can support the mission of conservation. It may seem paradoxical, but by creating a demand for these breeds it will encourage farmers to raise more animals which in turn helps genetic conservation. The breed that was prepared at the cooking clinic was the Hog Island sheep. The Hog Island sheep is a breed that has its beginnings in the 18th century. 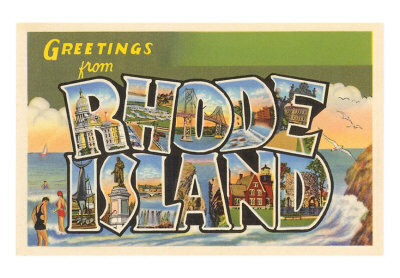 The breed was developed from British sheep living on Virginia’s barrier island, Hog Island, which was historically inhabited by America’s earliest colonists. The sheep evolved in response to the island’s natural selection for hardiness, foraging ability, and reproductive efficiency. In the 1930s, hurricanes destroyed Hog Island and forced inhabitants back to the mainland; however many of the sheep were left on the island and reverted to a feral state. In the 1970’s, the Nature Conservancy purchased Hog Island and most of the sheep were removed. 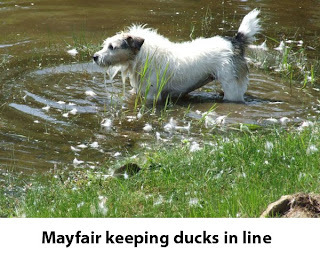 Today, the breed is extremely rare, with fewer than 200 animals registered annually. Hog Island sheep vary in physical appearance. 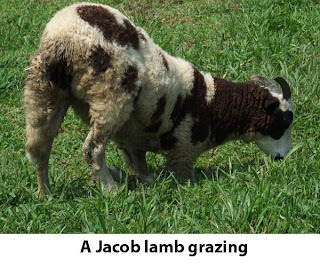 Most of the sheep are white wooled, though about twenty percent are black. Ewes may be horned or polled. Rams can have horns or are somewhat polled. Mature animals weigh between 90–150 pounds. Hog Island sheep are excellent foragers and prefer to browse rather than graze, if given the opportunity to do so. They stay in very tight flocks and are extremely alert in nature. 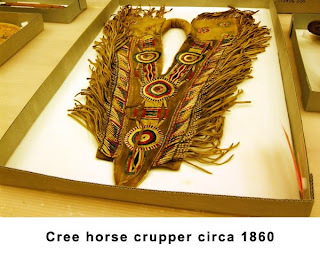 The breed is a rich part of American history and needs stewards to help it survive. The best part of the cooking event - the food! 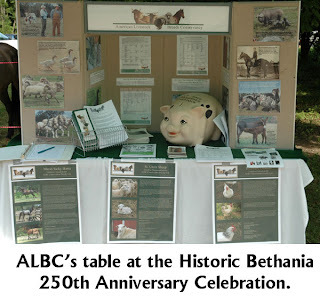 To learn more about Heritage breeds or how to incorporate them into your farm plan, resturant, or dinner table, contact the ALBC office or visit www.albc-usa.org. I left Tilley Foster Farm in Brewster, New York, and made my way south to meet with Craig Haney, Farm Manager of the Stone Barns Center for Food and Agriculture, in Tarrytown. He and I were scheduled to give a presentation together at the famous Astor Center in New York City that evening. Along the way, I wanted to stop in the infamous community of Sleepy Hollow (yes, it actually exists!) 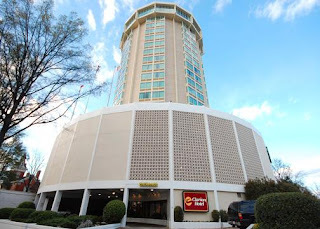 that is adjacent to Tarrytown. 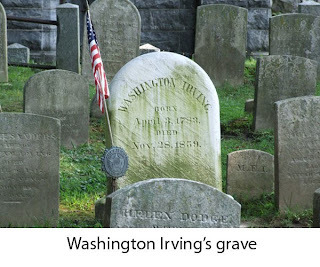 The first thing you notice coming into the town is the huge, historic cemetery where the famous author, Washington Irving, is buried. At the entrance to the cemetery is the former location of the bridge that Irving describes in his novel as “the place where poor Ichabod Crane meets the Headless Horseman.” The covered bridge is no longer there but there are the remains of a 17th century manor house. 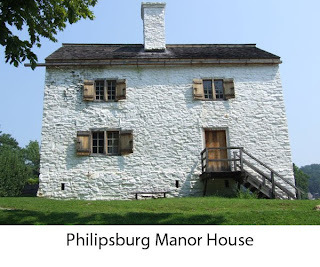 The property has become a living history museum that is open to the public. 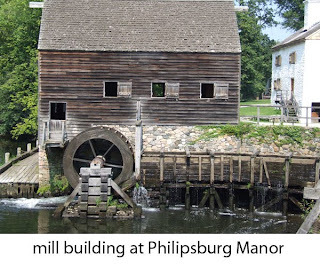 Philipsburg Manor is a beautiful facility that incorporates some rare breeds into its programs. 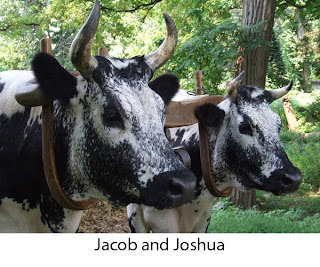 I came upon an impressive Randall Lineback oxen team comprised of Jacob and Joshua. The two, led by farm manager Stephen Kozack, were busy pulling a load of hay from a nearby field on the property. Along the way, they passed numerous Wiltshire Horn sheep crosses that populate the entire farm and make visitors feel as if they have stepped back in time onto a working farm. 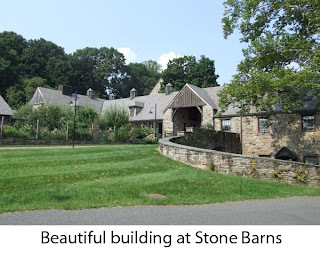 Time was growing short, so I made my way to Stone Barns in the next town over. Formerly an estate owned by David Rockefeller, the property is now open to the public and is dedicated to celebrating and teaching advanced community-based food production and enjoyment as well as “farm to classroom to table.” Several heritage crops and animals are raised at Stone Barns including heritage chickens, turkeys, and geese. I met up with Craig and along with his wife and new daughter and we made our way into New York City to the Astor Center. The Astor Center, located in NoHo on the eastern edge of Greenwich Village, has the reputation of selling one of the most diverse collections of wine and spirits in the entire city. 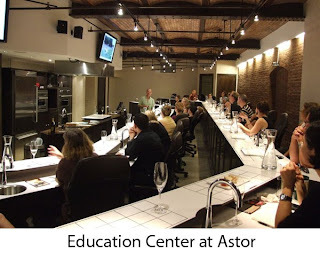 In keeping with the independent culture of “the village,” Astor goes beyond being just “another store” by offering a wide assortment of courses and presentations ranging from cooking, wine, food, and culture. ALBC was invited to the learning center at Astor to talk about rare breeds and how they are finding their way back onto farms and onto the American dinner table. 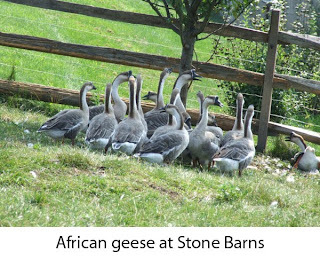 Craig followed by talking about how rare breeds are incorporated into the sustainable farming practices of Stone Barns. The class was nearly filled to capacity and was well received by attendees. Craig and I were very pleased to see several familiar faces of friends from the Slow Food USA national office in NYC. The trek northeast came to an end after NYC and I was very happy to finally make my way back to North Carolina and back to my own farm. My stay in North Carolina wasn’t very long as I had field work in Washington state and Oregon a couple of weeks later. On the road again…. 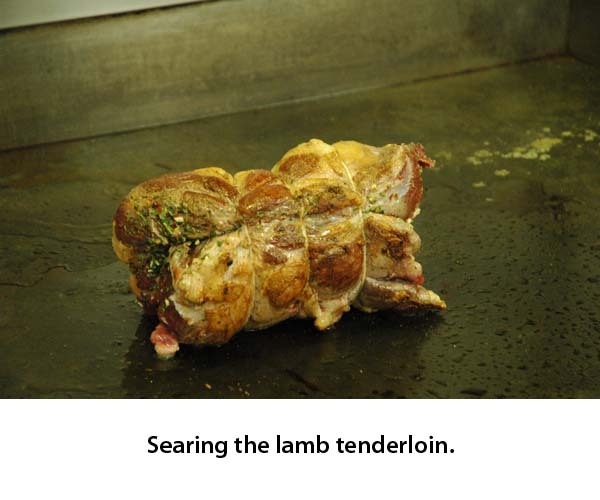 ALBC is very excited to share that Slow Food USA has added the St. Croix sheep breed to its “Ark of Taste.” The US Ark of Taste is a catalog of over 200 delicious foods in danger of extinction. Through the promotion and eating Ark products we can help ensure they remain in production and on our dinner tables. ALBC hopes that the St. Croix will enjoy population growth as a result of its recent listing on the Ark of Taste. We hope more people will learn about this breed and its great meat qualities. 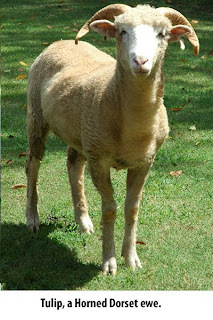 The St. Croix is an American sheep breed that is part of the Caribbean Hair sheep family of breeds. Caribbean Hair sheep were developed from the hair sheep of West Africa and a few European wooled sheep that were brought to the Caribbean beginning in the 1600s. The sheep proliferated as subsistence livestock, and they were also valued for the manure critical to sugar cane production. Over time, Caribbean Hair sheep became well adapted to the heat and humidity of their environment. 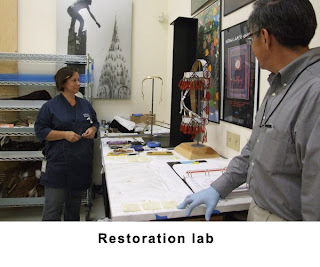 The hair coat, which eliminates the need for shearing, is part of this adaptation. Today, there are several landrace populations within this breed family in the Caribbean. Two breeds, the Barbados and the St. Croix, are also found in North America. In 1975, Dr. Warren Foote of Utah State University imported 22 ewes and three rams from St. Croix in the Virgin Islands. Foote chose a relatively consistent group of polled, white sheep from a landrace called Virgin Islands White. 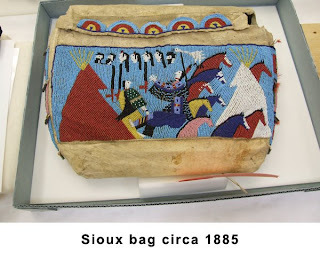 Offspring of this imported group were further selected for consistency of conformation, and this process has resulted in the development of the St. Croix, a standardized breed in the United States. The St. Croix is adapted to the heat and humidity of a tropical climate, and this adaptation has several manifestations. The breed has well documented parasite resistance, far superior to that found in most other sheep breeds. It is small, with ewes averaging 120 pounds and rams 165 pounds. 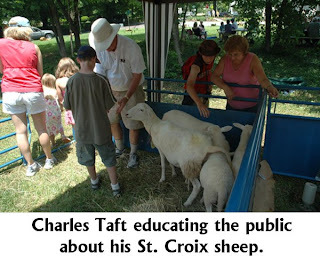 St. Croix sheep are known for high fertility, and ewe lambs become fertile at about six months of age. Ewes often produce twins and have plenty of milk to raise them. Two lambings a year are not uncommon. St. Croix sheep are excellent foragers and very easy keepers. Their browsing ability makes them useful for land management, including mowing grass in orchards and the control of invasive pest plants. Though heat tolerant, the sheep can be raised in many parts of North America. In colder areas, they grow a heavy winter coat of wool and hair that is shed in the spring. This combination of characteristics makes the breed an excellent choice for low input meat production. The St. Croix is increasing in numbers, and though it is still rare, the breed’s future seems promising. 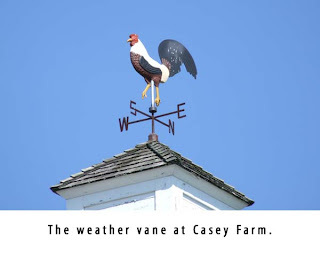 After leaving Rhode Island, the next stop on the road trip was Putnam County New York and Tilly Foster Farm Museum located in the city of Brewster. 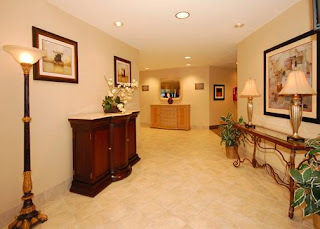 The farm itself is a beautiful historic property that once served as a premier Thoroughbred farm for the region. 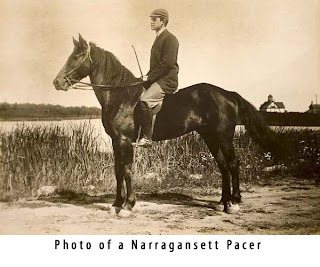 Horses can still be seen on the property, but instead of race horses, most are boarders whose owners enjoy the facilities that were once reserved for the cream of the equine crop in New York. 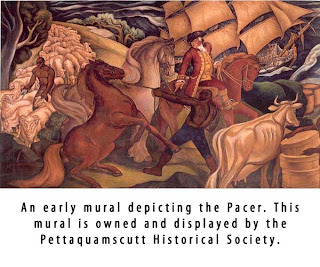 Through the efforts of George Whipple and The Whipple Foundation / Society for the Preservation of Putnam County Antiquities & Greenways, Tilly Foster Farm has been preserved to and will become a museum and home to an assortment of endangered American breeds of livestock and poultry. 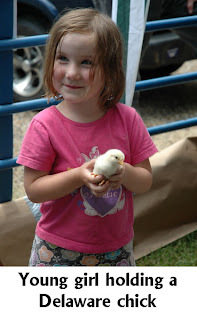 The primary goals of the foundation are to keep Tilly Foster Farm free and open to the people of Putnam County while making the farm self-sufficient to reduce the burden on the taxpayer. Whipple plans to build a a world-class farm museum that incorporates rare farm animals that will serve to educate the public about farming, local history, and animal husbandry. George’s personal commitment to rare breed conservation has made him a long-time member of ALBC since the organization’s early years. His relationship with ALBC has recently been broadened with his election to the ALBC Board of Directors. George grew up in Putnam County and is deeply concerned with preserving the beautiful rural qualities of the area in and around the county. 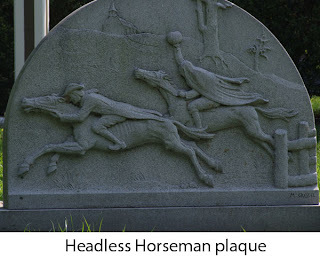 He still resides on his grandfather’s Pine View Farm in the rural town of Kent, not far from the farm museum. 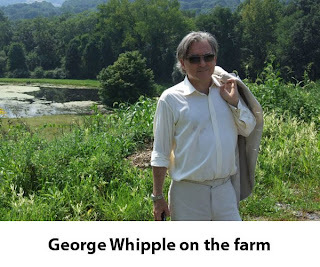 Outside of Putnam, George works in New York City and is known to New Yorkers for his celebrity interviews on Whipple’s World, a show he films for NY1 News. I had the pleasure of getting to know George when he first began thinking about livestock and poultry breeds on the farm. He called the ALBC office for advice on appropriate breeds for the farm and to determine where he could find them. As George and I visited the farm, we discussed the future of the facility and the development of programs to promote the rare breeds. Plans include utilizing a meeting facility and restaurant for on-farm seminars and classes. As part of the farm’s lecture programs, ALBC Board President Callene Rapp was scheduled to give a public presentation at the farm on raising heritage breed rabbits. Among the breeds we saw on the farm were Jacob (American) sheep, Blue American rabbits, Guinea hogs, Narragansett turkeys, several varieties of Heritage Chickens and ducks, and their famous American Mammoth Jackstock, Nate. Children’s book author Sheila Mealy recently made him a local celebrity by publishing a lovely book about the donkey and the adventures that brought him to Tilly Foster Farm. The basement level of one of the barns contains a wonderful display of antique farm equipment. A collection of tractors, valued at over one million dollars, is exhibited in the area. The machinery and displays are on loan to the farm by the Putnam County Antique Machinery Association. Some other assets of the farm include an impressive investment in infrastructure to make the property largely energy efficient through solar and wind power made on the farm. The solar array alone can produce up to 13,000 watts of electricity for the farm. Beyond the animals, Tilly Foster Farm also serves as a home for a unique rock and roll museum called Avalon Archives. 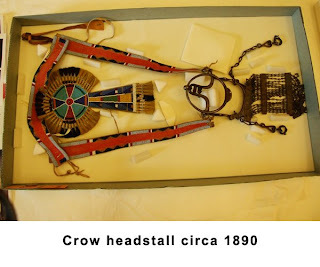 The museum’s collection is owned by a friend of George’s by the name of Ned Moran. Ned is a retired New York City firefighter and an amazing music guru to all that know him. Ned’s collection contains highly prized items and memorabilia that any rock and roll enthusiast would give their right eye for. 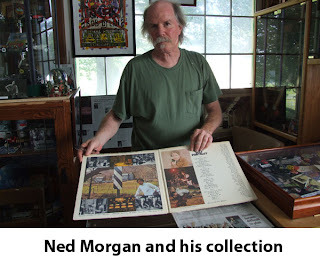 Ned began his collection while living in San Francisco between 1969-1974, a golden age of rock for many. It seemed only appropriate to take a step into the museum as that day happened to be the 32nd anniversary of the Elvis’ death and the 40th anniversary of Woodstock. Much of the collection consisted of highly coveted concert posters, cards, and artwork. 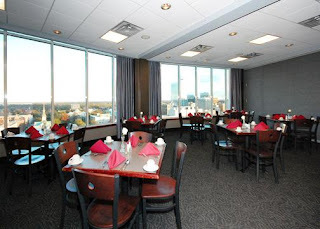 I’ve visited Cleveland’s Rock & Roll Hall of Fame, I can say that in comparison, Avalon’s intimate setting gives visitors a more tangible and personal connection to the history on the walls. After leaving the museum, I had the distinct feeling of just having spent a quiet afternoon with old friends in that building. By late afternoon, the temperature peaked (90°+!) and it was about time to finish the tour for the day. 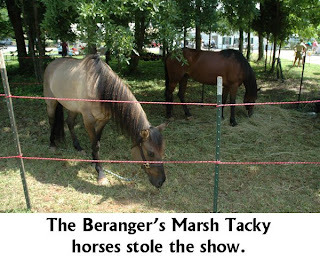 By then, most of the animals were in their barns or had the good sense to get in the shade and keep cool. Having spent a pleasant day in his company, I said my goodbyes to George and headed towards my next destination. 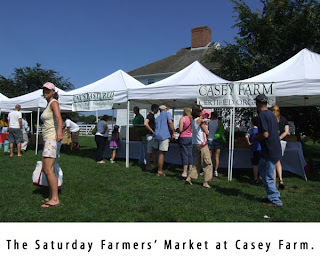 In the next installment, Jeannette will head to meet Craig Haney at the Stone Barns Center for Sustainable Agriculture. Join the Countryside Conservancy and the American Livestock Breeds Conservancy (ALBC) for a Buckeye Broiler Breeder Clinic in Peninsula,OH. The event will be held October 6, 2009, at the Happy Days Lodge. The clinic will begin with a one-hour lecture. 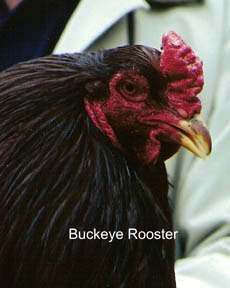 Learn about Heritage poultry breeds, their use in sustainable agriculture, ALBC's Buckeye Recovery Project, how to evaluate production traits, and practical breeding strategies for bloodlines improvements. The second hour of each session will be devoted to careful physical examination of Buckeye birds in order to understand how a breeder/grower can improve commercial traits over time. 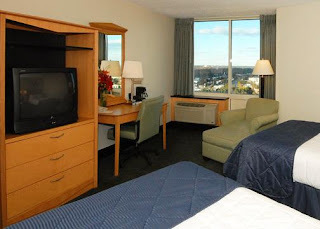 Cost: Registration: $100 per person or $150 per couple from the same farmoperation. To register for one of the Buckeye Breeder Clinics or to find outmore information about any of the events, contact swebb@cvcountryside.org or call (330) 657-2542. This Saturday, thousands of Tar Heel faithful will pack Kenan Stadium for the first Carolina football game of the season. As kick-off time nears, Ramses, the coveted UNC mascot will strut down the sidelines - beaming Tar Heel pride from his radiant blue horns. 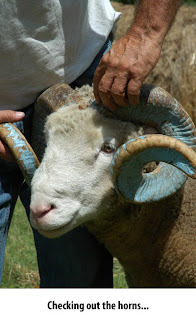 But behind the wooly coat and massive horns, Ramses hides a secret that few know – he’s part of a dying breed. 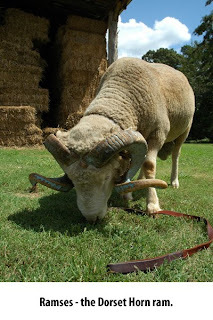 A Carolina tradition since 1924, Ramses the Dorset Horn sheep may soon be a mere legend. On any given game day the 60,000 fans that pack Kenan Stadium outnumber the estimated global population of Dorset Horns. In 2009, the American Livestock Breeds Conservancy listed the breed on its Conservation Priority List under the Watch Category, citing a global population of fewer than 10,000 breeding animals. On a hot, steamy August afternoon, I met with the Hogan family of Hogan’s Magnolia View Farm, just outside of Chapel Hill. 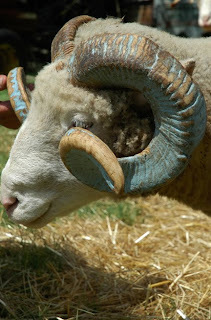 The Hogan family has kept Ramses for the past 85 years, helping to give the Dorset Horn breed a future, blue-horned ram after blue-horned ram. 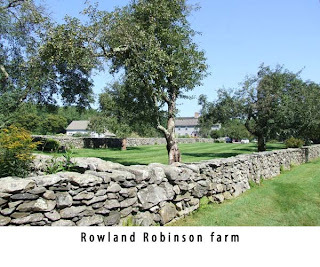 “My family has been on this farm since 1757. I’m a 9th generation farmer and 4th generation ram keeper,” said Rob Hogan. In 1924, the same year the ram was introduced as the mascot, Hogan’s great-grandfather assumed the duties of the ram keeper. “My great-granddad, Clay Hogan, had four sons and two were UNC alums. Henry Hogan played on the football team. I think between the farm’s proximity to campus and the family connection to the university - it just made sense,” said Hogan. The current Ramses is the 18th Horned Dorset kept by the Hogan family to go by this name. University archives suggest the first UNC Horned Dorset came from Texas in 1924, when then head cheerleader Vic Huggins suggested UNC get a live mascot to honor famed Jack Merrit, known to his fans as the "Battering Ram." This year, Ramses wife’s name is Tulip. Tulip was given to the Hogans from the Cassell family, in Wytheville, VA, right in the center of Hokie country. Yes, the baby Ramses may have some Hokie blood in its veins. One great benefit of the Horned Dorset breed is that they can reproduce out of season, a quality not seen in most wooled breeds. If properly managed, Horned Dorset ewes can give birth three times over the course of just two years. So why is the Dorset Horn sheep an endangered breed? The “blow to the horns” came from one of UNC’s biggest rivals, North Carolina State University. The rivalry went beyond the football field and into the genetic arena. In 1949, a Horned Dorset ram on an N.C. State farm sired four hornless ewes. 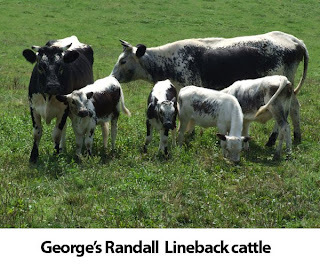 Over the next five years, the late livestock scientists Dr. Lemuel Goode and Sam Buchanan bred the Horned Dorset ram to those four ewes and all other ewes in the flock. Finally in 1954, a ewe delivered twin rams, one with horns and one without. Within 20 years, 70 percent of all registered Dorsets were hornless (polled). And with that, it was time to go find Ramses the Horned Dorset for his one-on-one. In the heat of the afternoon, he was cooling his “heels” in the wooded area of the pasture and close-by was Tulip, his current mate. Hogan approached him and convinced him to give up his shady spot for a bit. Hogan commented, “Obviously he has a good temperament. He goes down in front of 60,000 people on any given Saturday and the bands are playing, fireworks are going off, people are hooting and hollering, and Ramses is unscathed.” Hogan says Ramses’ docile nature is just part of the breed along with some proper handling and training. Hogan’s entire family joins in the pre-game prepping of Ramses. 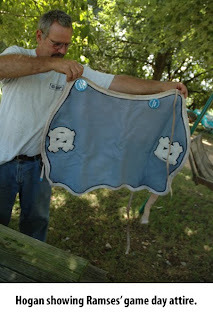 Hogan’s Aunt Carolyn makes Ramses game attire which is his Carolina blue blanket. Hogan’s sons help with cleaning and prepping the animal and on game day they all enjoy the ride to town, with Ramses in the back of the pick-up truck. As Ramses grazed in the pasture, Hogan chuckled as he shared some of his favorite questions people ask. “They always want to know where I found a sheep with blue horns. 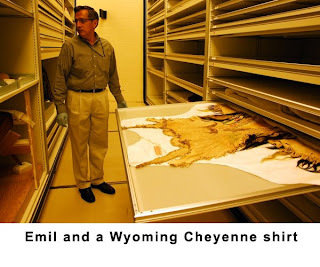 Or, they want to know if it’s male or female – never mind the two foot long testicles on the ram.” Hogan’s wife Ann added, “They always ask if he’s real.” Ram-napping stories are also a regular source of laughter for the two. 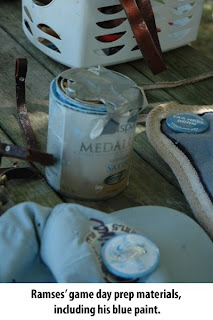 As I touched the faded blue paint on Ramses horns I was reminiscent of seasons past. While admiring this symbol of Tar Heel tradition, I could not help but wonder about the future of the breed and many others. Over 170 breeds of livestock and poultry are considered a Conservation Priority by the American Livestock Breeds Conservancy, and the list is growing. So this Saturday and every game day, amongst the cheers, and bands and excitement – thank the Hogans for all that they do for this breed and thank all the other Horned Dorset breeders out there helping to keep the breed alive. And when Ramses the coveted UNC mascot struts down those sidelines - beaming Tar Heel pride from his radiant blue horns – don’t take him for granted. 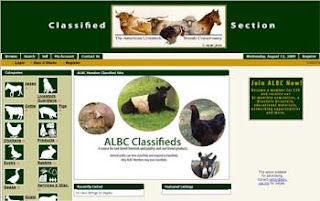 For more information on how to help save heritage breeds of livestock, visit http://www.albc-usa.org/.